Short bowel syndrome (SBS) results from the alteration of intestinal digestion and absorption that occurs after extensive bowel resection. It is a complex disorder with nutritional, metabolic, and infectious consequences. Bowel obstruction is a potential complication of SBS (see the image below). 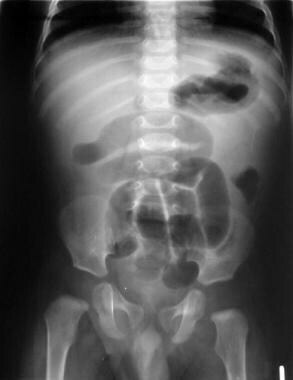 Small-bowel obstruction caused by intussusception in a 5-month-old patient is visible on plain radiograph. Children with cloacal exstrophy do not have SBS in the classical sense but often have all the signs and symptoms associated with functional intestinal failure. Few conditions in pediatric gastroenterology pose as great a challenge as short bowel syndrome (SBS). Short bowel syndrome is the result of the alteration of intestinal digestion and absorption that occurs following extensive bowel resection. It represents a complex disorder that affects normal intestinal physiology with nutritional, metabolic, and infectious consequences. The small intestine of the neonate is approximately 250 cm in length. By adulthood, the small intestine grows to approximately 750 cm. As a consequence, the infant and the young child have a favorable long-term prognosis compared to an adult in regards to potential intestinal growth after intestinal resection. Intestinal adaptation may take weeks to months to be achieved; in the interim, children who have had intestinal resection need nutritional support through various therapeutic measures, including parenteral nutrition. The duodenum and jejunum are responsible for the absorption of most dietary constituents except vitamin B-12 and bile acids. In general, virtually all digestion and absorption is completed within the first 100-150 cm of jejunum in a healthy individual. In the absence of an intact colon, the minimum length of healthy bowel necessary to avoid parenteral nutrition is approximately 100 cm. Patients who have less than 100 cm of jejunum exhibit significant malabsorption. Although the ileum is limited in its capacity to form chylomicrons compared to the jejunum, studies have shown that the ileum has greater adaptive function as far as improving its absorptive function in the presence of short bowel syndrome. Similarly, studies in animals have shown that intestinal transit time is more likely to improve (ie, increase) in patients with proximal small-bowel resection as opposed to patients with distal small-bowel resection. The jejunum cannot develop site-specific carriers for the transportation of vitamin B12 and bile salts, and, consequently, these are malabsorbed permanently in patients, following ileal resection. Furthermore, the loss of enteroglucagon and peptide YY cannot be underscored in the regulation of small-bowel motility. The leading causes of death in infants with short bowel syndrome who are being treated with parenteral nutrition are central line sepsis and liver failure with the prolonged use of parenteral nutrition. Cole CR, Hansen NI, Higgins RD, Ziegler TR, Stoll BJ. Very low birth weight preterm infants with surgical short bowel syndrome: incidence, morbidity and mortality, and growth outcomes at 18 to 22 months. Pediatrics. 2008 Sep. 122(3):e573-82. [Medline]. [Full Text]. Weih S, Kessler M, Fonouni H, Golriz M, Hafezi M, Mehrabi A, et al. Current practice and future perspectives in the treatment of short bowel syndrome in children-a systematic review. Langenbecks Arch Surg. 2011 Nov 22. [Medline]. Goday PS. Short bowel syndrome: how short is too short?. Clin Perinatol. 2009 Mar. 36(1):101-10. [Medline]. Seres D, Sacks GS, Pedersen CA, et al. Parenteral nutrition safe practices: results of the 2003 American Society for Parenteral and Enteral Nutrition survey. JPEN J Parenter Enteral Nutr. 2006 May-Jun. 30(3):259-65. [Medline]. Goulet OJ, Revillon Y, Jan D, et al. Neonatal short bowel syndrome. J Pediatr. 1991 Jul. 119(1 ( Pt 1)):18-23. [Medline]. Novak B. Long-term teduglutide frees some short bowel patients from parenteral support. Medscape Medical News. January 27, 2014. [Full Text]. Jeppesen PB. Teduglutide, a novel glucagon-like peptide 2 analog, in the treatment of patients with short bowel syndrome. Therap Adv Gastroenterol. 2012 May. 5(3):159-71. [Medline]. Jeppesen PB, Staun M, Tjellesen L, Mortensen PB. Effect of intravenous ranitidine and omeprazole on intestinal absorption of water, sodium, and macronutrients in patients with intestinal resection. Gut. 1998 Dec. 43(6):763-9. [Medline]. Guo M, Li Y, Li J. Role of Growth Hormone, Glutamine and Enteral Nutrition in Pediatric Short Bowel Syndrome: A Pilot Follow-Up Study. Eur J Pediatr Surg. 2011 Dec 7. [Medline]. Greenberg RG, Moran C, Ulshen M, Smith PB, Benjamin DK Jr, Cohen-Wolkowiez M. Outcomes of catheter-associated infections in pediatric patients with short bowel syndrome. J Pediatr Gastroenterol Nutr. 2010 Apr. 50(4):460-2. [Medline]. [Full Text]. Chung PH, Wong KK, Wong RM, Tsoi NS, Chan KL, Tam PK. Clinical experience in managing pediatric patients with ultra-short bowel syndrome using omega-3 fatty acid. Eur J Pediatr Surg. 2010 Mar. 20(2):139-42. [Medline]. Park KT, Nespor C, Kerner J Jr. The use of Omegaven in treating parenteral nutrition-associated liver disease. J Perinatol. 2011 Apr. 31 Suppl 1:S57-60. [Medline]. Ascher DP, Shoupe BA, Maybee D, Fischer GW. Persistent catheter-related bacteremia: clearance with antibiotics and urokinase. J Pediatr Surg. 1993 Apr. 28(4):627-9. [Medline]. Bernard DK, Shaw MJ. Principles of nutrition therapy for short-bowel syndrome. Nutr Clin Pract. 1993 Aug. 8(4):153-62. [Medline]. Bloom SR. Gut hormones in adaptation. Gut. 1987. 28 Suppl:31-5. [Medline]. Buchman AL. The clinical management of short bowel syndrome: steps to avoid parenteral nutrition. Nutrition. 1997 Oct. 13(10):907-13. [Medline]. Byrne TA, Persinger RL, Young LS, et al. A new treatment for patients with short-bowel syndrome. Growth hormone, glutamine, and a modified diet. Ann Surg. 1995 Sep. 222(3):243-54; discussion 254-5. [Medline]. Capron JP, Gineston JL, Herve MA, Braillon A. Metronidazole in prevention of cholestasis associated with total parenteral nutrition. Lancet. 1983 Feb 26. 1(8322):446-7. [Medline]. Cole CR, Ziegler TR. Small bowel bacterial overgrowth: a negative factor in gut adaptation in pediatric SBS. Curr Gastroenterol Rep. 2007 Dec. 9(6):456-62. [Medline]. Cosnes L, Carbonnel F, Beaugerie L. Functional adaptation after extensive small bowel resection in humans. Eur J Gastroenterol Hepatol. 1994. 6:197. Cummings JH. Colonic absorption: the importance of short chain fatty acids in man. Scand J Gastroenterol Suppl. 1984. 93:89-99. [Medline]. Dudrick SJ, Latifi R, Fosnocht DE. Management of the short-bowel syndrome. Surg Clin North Am. 1991 Jun. 71(3):625-43. [Medline]. Fine H, Levine GM, Shiau YF. Effects of cholecystokinin and secretin on intestinal structure and function. Am J Physiol. 1983 Sep. 245(3):G358-63. [Medline]. Fordtran JS, Dietschy JM. Water and electrolyte movement in the intestine. Gastroenterology. 1966 Feb. 50(2):263-85. [Medline]. Gazet JC, Kopp J. The surgical significance of the ileocecal junction. Surgery. 1964. 56:565-73. Grant D. Current results of intestinal transplantation. The International Intestinal Transplant Registry. Lancet. 1996 Jun 29. 347(9018):1801-3. [Medline]. Grosfeld JL, Rescorla FJ, West KW. Short bowel syndrome in infancy and childhood. Analysis of survival in 60 patients. Am J Surg. 1986 Jan. 151(1):41-6. [Medline]. Hays TL, Saavedra JM, Mattis LE. The use of high-fat low-carbohydrate diets for advancement of enteral feedings in children with short bowel syndrome. Top Clin Nutr. 1995. 10(4):35-41. Hofmann AF, Poley JR. Role of bile acid malabsorption in pathogenesis of diarrhea and steatorrhea in patients with ileal resection. I. Response to cholestyramine or replacement of dietary long chain triglyceride by medium chain triglyceride. Gastroenterology. 1972 May. 62(5):918-34. [Medline]. Hwang TL, O'Dwyer ST, Smith RJ. Preservation of small bowel mucosa using glutamine enriched parenteral nutrition. Surg Forum. 1986. 37:56-8. Hylander E, Ladefoged K, Jarnum S. Calcium absorption after intestinal resection. The importance of a preserved colon. Scand J Gastroenterol. 1990 Jul. 25(7):705-10. [Medline]. Hyman PE, Everett SL, Harada T. Gastric acid hypersecretion in short bowel syndrome in infants: association with extent of resection and enteral feeding. J Pediatr Gastroenterol Nutr. 1986 Mar-Apr. 5(2):191-7. [Medline]. Infantino BJ, Mercer DF, Hobson BD, Fischer RT, Gerhardt BK, Grant WJ, et al. Successful Rehabilitation in Pediatric Ultrashort Small Bowel Syndrome. J Pediatr. 2013 Jul 15. [Medline]. Jeejeebhoy KN. Therapy of the short-gut syndrome. Lancet. 1983 Jun 25. 1(8339):1427-30. [Medline]. Klish WJ, Putnam TC. The short gut. Am J Dis Child. 1981 Nov. 135(11):1056-61. [Medline]. Langnas AN, Shaw BW Jr, Antonson DL, et al. Preliminary experience with intestinal transplantation in infants and children. Pediatrics. 1996 Apr. 97(4):443-8. [Medline]. Levine GM, Deren JJ, Yezdimir E. Small-bowel resection. Oral intake is the stimulus for hyperplasia. Am J Dig Dis. 1976 Jul. 21(7):542-6. [Medline]. Lowry SF, Brennan MF. Abnormal liver function during parenteral nutrition: Relation to infusion excess. J Surg Res. 1979. 26:300-7. Marotta RB, Floch MH. Dietary therapy of steatorrhea. Gastroenterol Clin North Am. 1989 Sep. 18(3):485-512. [Medline]. Messing B, Pigot F, Rongier M, et al. Intestinal absorption of free oral hyperalimentation in the very short bowel syndrome. Gastroenterology. 1991 Jun. 100(6):1502-8. [Medline]. Nightingale JM, Kamm MA, van der Sijp JR, et al. Disturbed gastric emptying in the short bowel syndrome. Evidence for a 'colonic brake'. Gut. 1993 Sep. 34(9):1171-6. [Medline]. Nordgaard I, Hansen BS, Mortensen PB. Importance of colonic support for energy absorption as small-bowel failure proceeds. Am J Clin Nutr. 1996 Aug. 64(2):222-31. [Medline]. Parker P, Stroop S, Greene H. A controlled comparison of continuous versus intermittent feeding in the treatment of infants with intestinal disease. J Pediatr. 1981 Sep. 99(3):360-4. [Medline]. Purdum PP 3d, Kirby DF. Short-bowel syndrome: a review of the role of nutrition support. JPEN J Parenter Enteral Nutr. 1991 Jan-Feb. 15(1):93-101. [Medline]. Reyes J, Todo S, Bueno J, et al. Intestinal transplantation in children: five-year experience. Transplant Proc. 1996 Oct. 28(5):2755-6. [Medline]. Scolapio JS, Camilleri M, Fleming CR, et al. Effect of growth hormone, glutamine, and diet on adaptation in short-bowel syndrome: a randomized, controlled study. Gastroenterology. 1997 Oct. 113(4):1074-81. [Medline]. Sheldon GF, Peterson SR, Sanders R. Hepatic dysfunction during hyperalimentation. Arch Surg. 1978 Apr. 113(4):504-8. [Medline]. Sial S, Koussayer T, Klein S. Nutritional management of a patient with short-bowel syndrome and large-volume jejunostomy output. Nutrition. 1994 Jan-Feb. 10(1):37-40; discussion 40-1. [Medline]. Spagnuolo MI, Iorio R, Vegnente A, Guarino A. Ursodeoxycholic acid for treatment of cholestasis in children on long-term total parenteral nutrition: a pilot study. Gastroenterology. 1996 Sep. 111(3):716-9. [Medline]. Thompson JS. Surgical management of short bowel syndrome. Surgery. 1993 Jan. 113(1):4-7. [Medline]. Thompson JS, Rikkers LF. Surgical alternatives for the short bowel syndrome. Am J Gastroenterol. 1987 Feb. 82(2):97-106. [Medline]. Todo S, Tzakis AG, Abu-Elmagd K, et al. Cadaveric small bowel and small bowel-liver transplantation in humans. Transplantation. 1992 Feb. 53(2):369-76. [Medline]. Treem WR. Short bowel syndrome. Wyllie R, Hyams JS, eds. Pediatric Gastrointestinal Disease: Pathophysiology, Diagnosis, Management. Philadelphia, PA: WB Saunders; 1993. 573-603. Vileisis RA, Inwood RJ, Hunt CE. Prospective controlled study of parenteral nutrition-associated cholestatic jaundice: effect of protein intake. J Pediatr. 1980 May. 96(5):893-7. [Medline]. Woolf GM, Miller C, Kurian R, Jeejeebhoy KN. Diet for patients with a short bowel: high fat or high carbohydrate?. Gastroenterology. 1983 Apr. 84(4):823-8. [Medline]. Zahavi I, Shaffer EA, Gall DG. Total parenteral nutrition-associated cholestasis: acute studies in infant and adult rabbits. J Pediatr Gastroenterol Nutr. 1985 Aug. 4(4):622-7. [Medline]. Zurier RB, Campbell RG, Hashim SA, Van Itallie TB. Use of medium-chain triglyceride in management of patients with massive resection of the small intestine. N Engl J Med. 1966 Mar 3. 274(9):490-3. [Medline]. Carroll RE, Benedetti E, Schowalter JP, Buchman AL. Management and Complications of Short Bowel Syndrome: an Updated Review. Curr Gastroenterol Rep. 2016 Jul. 18 (7):40. [Medline]. Disclosure: Received honoraria from Prometheus Laboratories for speaking and teaching; Received honoraria from Abbott Nutritionals for speaking and teaching. for: Abbott Nutritional, Abbvie, speakers' bureau. Disclosure: Serve(d) as a director, officer, partner, employee, advisor, consultant or trustee for: Nestle<br/>Serve(d) as a speaker or a member of a speakers bureau for: Nestle<br/>Received income in an amount equal to or greater than $250 from: Nestle. Fast Five Quiz: How Much Do You Know About Irritable Bowel Syndrome? Fast Five Quiz: Do You Know Key Differences Between Irritable Bowel Syndrome and Inflammatory Bowel Disease?